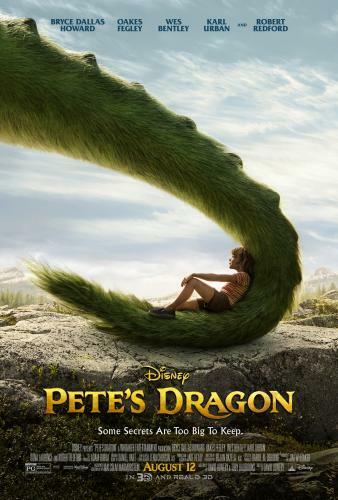 In the 70’s Walt Disney Studios released the live-action/animated musical “Pete’s Dragon”. The all-star cast with Mickey Rooney, Helen Reddy, Red Buttons and Shelley Winters made the tale, of a young boy and his friendship with a magical green dragon, come to life. Disney longed to introduce this original beloved family film Pete’s Dragon to a new generation of film viewers. Confident the story based on the screenplay by Malcolm Marmorstein was never-ending but still had life for a fresher version. Looking to come up with a different angle to the story, Disney collaborates with executive producer Barrie M. Osborne, producer Jim Whitaker along with screenwriters David Lowery and Toby Halbrooks. Lowery and Halbrooks tend to gravitate to projects that have a certain innocence which makes the two writers ideal for this job. Lowery says, “I loved the idea of making a movie that deals with imagination and has a degree of fantasy.” Whitaker adds, “David was after a sense of, what he calls, ‘magical realism’ and that came through because he allowed magic to seep into the script in unexpected ways.” Simply the way Pete’s dragon looks causes a paradigm shift. The story of Pete’s dragon is timeless. Lowery intended his version to be the same. Chosen to direct the feature film, he says, “I find that the movies I return to and that I love the most are the ones that don’t feel dated.” The lessons one learns in discovering a different world than their own is endless. One theme dealt with in Pete’s Dragon is trust. Halbrooks says, “Pete (the human boy) has learned to only trust Elliot (his magical dragon friend).” After an encounter with a human lady who shows him kindness, Pete must figure out if the people that look like him can be trusted. Lowery’s feature film Ain’t Them Bodies Saints, asks a fundamental question, “Where does one belong?” Understanding the importance of belonging, Lowery identifies with Pete’s longing for family. In this way, Disney classic films like Dumbo and Bambi, convey to children the need to be empowered with tools and guidance to cope with issues their lives will encounter in order to belong. Old wood carver Mr. Meacham (Robert Redford) from Millhaven’s small logging town lives near the forest edge in the Pacific Northwest. After his wife died, he spent many a day in the forest. Mostly alone but sometimes with his precious daughter, Grace (Bryce Dallas Howard). He found comfort among nature. Solitude with his memories. Delight with his ever inquisitive daughter. And, adventure with his non-imaginary, big, green dragon. His adventures in the forest give him opportunity to share his unbelievable tales to many generations of children in his community. His most beloved stories are about him and a big, green dragon. Meacham claims they are experiences of truth but has no other witnesses other than his friend the dragon to support his storytelling. None-the-less, his delight as the community storyteller gives him license to thrill the children with his adventures that could one day be theirs. In addition, he tries to help the children develop their imagination skills he feels is invaluable for life. The wood carver doesn’t want to forget his incredible adventures so shares them with others because of the joy it brings. Old Mr. Meacham’s stories always begin with, ‘once upon a time,’ and without fail children delight in what tickles their ears next. Never a disappointing word. Years pass. The captive audience for his tall tales grow-up. However, they send their children to listen to Old Mr. Meacham in his wood carving studio. It’s a safe place where the parents know imagination will grow. The wood carver’s daughter, Grace is the local forest ranger now and one day comes to her dad with her own tall tale. He listens as she claims to have found a ten-year-old boy named, Pete (Oakes Fegley) living in the forest. Pete tells her that he has no family but lives with his friend, Elliot deep in the forest woods. He describes Elliott to her with remarkable similarities to stories of her dad’s dragon–giant, green, and furry with wings. Old Mr. Meacham stares toward the forest deep with eyes full of wonderment and smiles.